(a) Install SST on piping clamp. HINT: Make sure the direction of the piping clamp claw and SST by seeing the illustration shown on the caution label. (b) Push down the SST and release the clamp lock. NOTICE: Be careful not to deform the tube when pushing SST. (c) Pull SST slightly and push the release lever, and then remove the piping clamp with SST. (d) Disconnect the cooler refrigerant suction hose No.1. Do not use tools like screwdriver to remove the tube. (e) Remove the 2 O-rings from the cooler refrigerant suction hose No.1. (a) Using pliers, grip the claws of the clip and slide the clip, and then disconnect the heater outlet water hose. Do not apply any excessive force to the heater outlet water hose. Prepare a drain pan or cloth for when the cooling water leaks. (a) Disconnection of the heater inlet water hose is same as the heater outlet water hose. 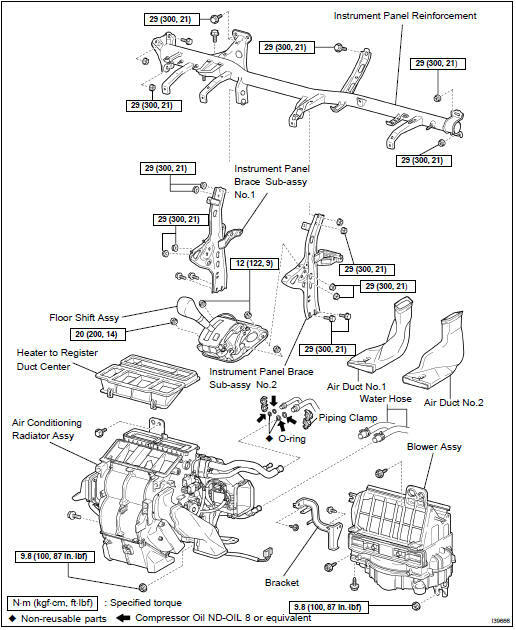 HINT: Refer to the instructions for removal of the instrument panel safety pad sub-assy. (a) Remove the 2 bolts and 2 nuts, disconnect the steering column assy from the instrument panel reinforcement assy. (a) Remove the 2 nuts and disconnect the shift cable. (b) Remove the 4 nuts and disconnect transmission floor shift assy. (a) Remove the side scuff plate. (b) Take up the floor carpet. HINT: Take up the floor carpet so that the air duct rear No.2 can be removed. (c) Remove the air duct rear No.2. HINT: Remove it in the same way with the air duct rear No.2. (a) Disconnect the connector clamp. (b) Remove the 3 bolts, 2 nuts and instrument panel brace sub-assy No.1. (a) Remove the 2 bolts, 2 nuts and instrument panel brace sub-assy No.2. (b) Remove the 2 nuts, and ECU. (a) Remove the bolt and 2 nuts, disconnect the instrument panel junction block assy. (b) Remove the 2 nuts and skid control ECU assy. (a) Remove the 5 bolts, 4 nuts and instrument panel reinforcement assy. (b) Disconnect the connectors connecting the wiring air indicator harness sub-assy and vehicle harness. (c) Remove the 2 bolts, 2 nuts and air conditioner unit assy. (a) Remove the screw, disconnect the connected part of the duct and take off the air duct No.2. (b) Remove the 4 screws and bracket. (a) Release the 3 claw fittings, remove the air duct No.1. (a) Release the 4 claw fittings, remove the heater to register duct center. (a) Remove the 3 screws and mode damper servo sub-assy. (a) Remove the wiring air conditioning harness sub-assy from the air conditioner radiator assy. (a) Remove the 3 screws and airmix damper servo sub-assy. (a) Remove the screw and clamp. (b) Remove the heater radiator unit sub-assy from the air conditioner radiator assy. (a) Remove the 2 screws and blower motor control. (a) Remove the 2 screws and blower resistor. (a) Remove the wiring air indicator harness sub-assy No.2 from the blower motor control. (a) Using a hexagon wrench 4 mm (0.16 in. ), remove the 2 hexagon bolts and cooler expansion valve. (b) Remove the 2 O-rings from the air conditioner tube assy. (a) Remove the 11 screws and radiator case. (b) Remove the cooler evaporator sub-assy No.1 from the air conditioner radiator assy. (c) Remove the 2 O-rings from the cooler evaporator subassy No.1. (b) Install the 2 O-rings on the coder evaporator sub-assy No.1. 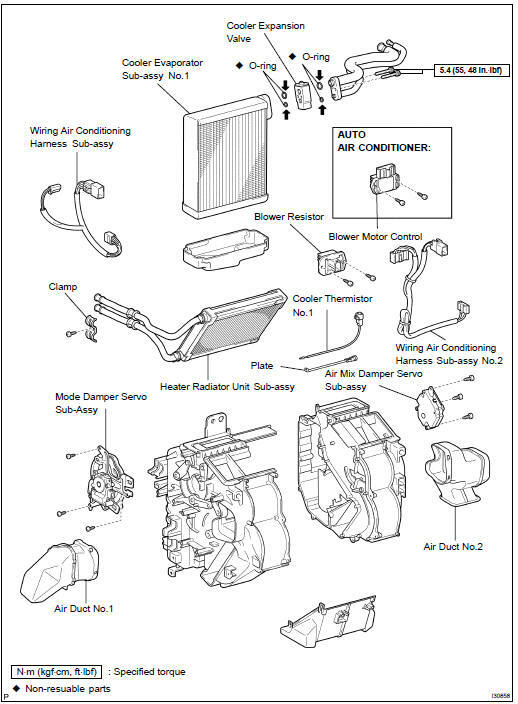 (c) Install the cooler evaporator No.1 to the air conditioner radiator assy. (d) Install the evaporator cover with the 11 screws. (a) Sufficiently apply compressor oil to the 2 new O-rings and fitting surface of the air conditioning tube assy. Compressor oil: ND-OIL 8 or equivalent (b) Install the 2 O-rings on the air conditioning tube assy. (c) Using a hexagon wrench 4mm (0.15 in. ), install the cooler expansion valve and 2 hexagon bolts to the cooler evaporator No.1. (a) Install the air conditioner unit assy with the 2 bolts and 2 nuts. (b) Connect the connectors connecting the wiring air indicator No.2 harness and vehicle harness. (c) Install the connector and clamp. (a) Install the instrument panel reinforcement assy with the 5 bolts and 4 nuts. (a) Install the skid control ECU assy with the 2 nuts. (a) Install the instrument panel junction block assy with the bolt and 2 nuts. (a) Install the ECM with the 2 nuts. (a) Install the instrument panel brace sub-assy No.2 with the 2 bolts and 2 nuts. (a) Install the instrument panel brace sub-assy No.1 with the 3 bolts and 2 nuts. (a) Install the floor shift assy with the 4 nuts. NOTICE: Tighten the nuts in numerical order shown in the illustration to install the floor shift assy. (b) Install the shift cable with the 2 nuts. (a) Install the steering column assy with the 2 bolts and 2 nuts. (b) Coat a new O-ring with compressor oil and install them to the hose. Compressor oil: ND-OIL 8 or equivalent (c) Install the cooler refrigerant suction pipe No.1 and piping clamp. Be sure to connect the pipe securely. After connection, check the fitting for claw of the piping clamp. (b) Coat a new O-ring with compressor oil and install it to the pipe. Compressor oil: ND-OIL 8 or equivalent (c) Install the cooler refrigerant liquid pipe A and piping clamp.